I had a very exciting chase this evening in the STL area. Did something I prefer not to do, chased through the metro area, but it was evening of a holiday with no ballgames or other events to create congestion, so I went for it. It was evident by 6:30 that, at best, the storms were barely going to make it into Illinois before dark, so considering that and the lack of congestion, I decided if I wanted to see them I had no choice but to go through the metro area. When I left home, storms were intensifying in a very high CAPE (2500-3000) and high-shear environment (SRH above 200) along an outflow boundary from morning convection. I headed west on I-270, planning an intercept along 70 somewhere between St. Charles and Warrenton. However, as I went I saw a huge overshooting top at the SE edge of the storm cluster, so I figured the storms were building to the SE and would take something of a more due-east track. Also, they appear to have developed closer to the metro area. So, rather than heading west on I-70, I worked around the metro area on I-270 and headed west on U.S. 40/I-64 for an intercept in west St. Louis Co. I intercepted the severe storm in Chesterfield, MO around 7:20, viewing it from the parking lot of a restaurant near the top of the Missouri River bluffs. The storm was spectacular and back-lit, and formed several small lowerings under the updraft. Just left of center in the preceding picture shows about the closest the storm got to producing a wall cloud. I really thought ATTM that the storm might produce a tube in the high-CAPE/high-shear environment, but am glad it didn't as it would have gone right through the metro area. The straight-line winds that did occur caused more than enough problems as it was. This picture shows the intense shelf cloud that formed ahead of the precipitation core as the storm began to produce intense outflow winds. Minutes after I left this spot, a 70 mph gust was recorded at Spirit of St. Louis Airport a couple miles from where I took these pictures. The storm then became ouflow-dominant and chased me back east through St. Louis into Madison Co., as it produced winds to 70 mph through the metro area. After my last viewing stop in Fairmount City, I really had to haul north and east to get out of the way, as it surged east very fast. The storm produced tremendous amounts of CG lightning bolts, like this one near Fairmount City. As I blasted north on I-255 to get out of the way of the storm, I got this picture, perhaps the day's best, out of the window of the car looking northwest from near the interseciton of I-255 and IL route 162. The storm surged over this spot within less than 5 minutes after I took this picture. 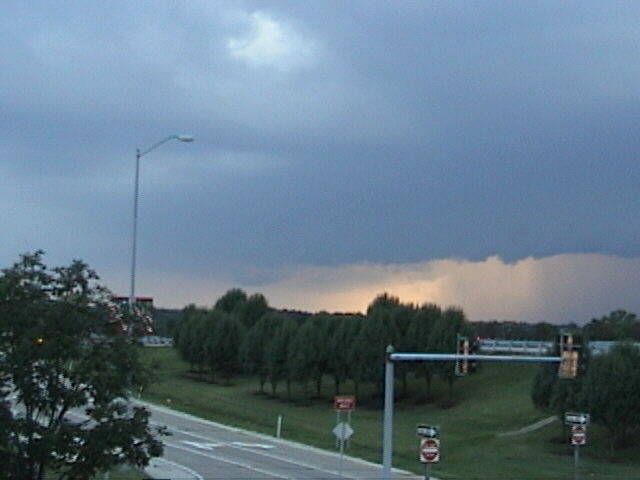 Note the wide but small lowering ahead of the front flank of the storm - this may be the beginning of what was 15 or 20 minutes later to become a significant feature after the north end of the gust front surged over Edwardsville. I got around what was then the strongest part of the storm as it surged across I-255 just behind me, cutting back home toward Edwardsville at Poag Road, hoping to beat it home as it was now getting dark. 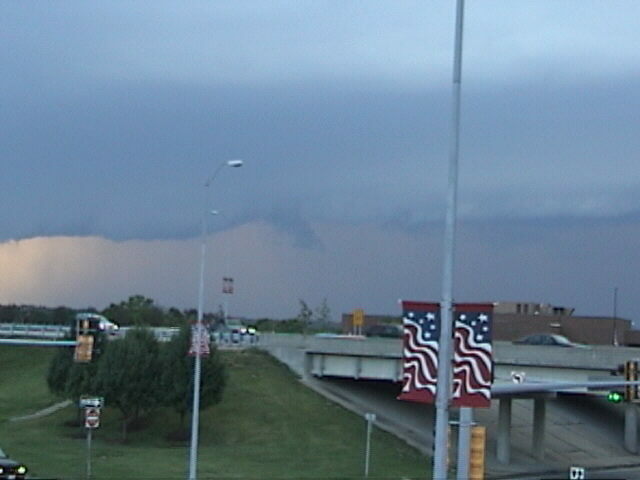 As I worked my way through Edwardsville, the northeastern part of the shelf cloud surged over, and from downtown Edwardsville looking SE, I saw a couple of what I really thought were scud fingers, definitely under the shelf cloud but with violent motion and maybe halfway down. I thought, "that kind of looks like some tornado video I've seen," but really gave it little thought because it just did not seem to be in the right part of the storm - just figured it was scud fingers from the violent outflow. However, minutes later, a tornado was reported by the IL state police 2 or 3 mi east of I-55 along IL 143 (which I was on when I saw the lowerings); this would have been under one of these lowerings. At first I discounted it as a likely "sheriffnado," but when I watched radar loops the storm did develop a notch on the front side around that time which was very persistent and resulted in another tornado report farther east an hour or so later. Moreover, a new area of intense precip formed just northwest of the reported tornado location then split off to the northeast as the main storm moved east. (If you look back at the last picture, you may see the beginnings of this notch/split between the northeast flank of the gust front and the lowering ahead of it.) So I didn't know until recently whether it was really a tornado or not, but the notch, the split, and the subsequent tornado report suggest it may have been. And indeed, according to NCDC Storm Events, it has been confirmed by the NWS as a tornado, as discussed further below. 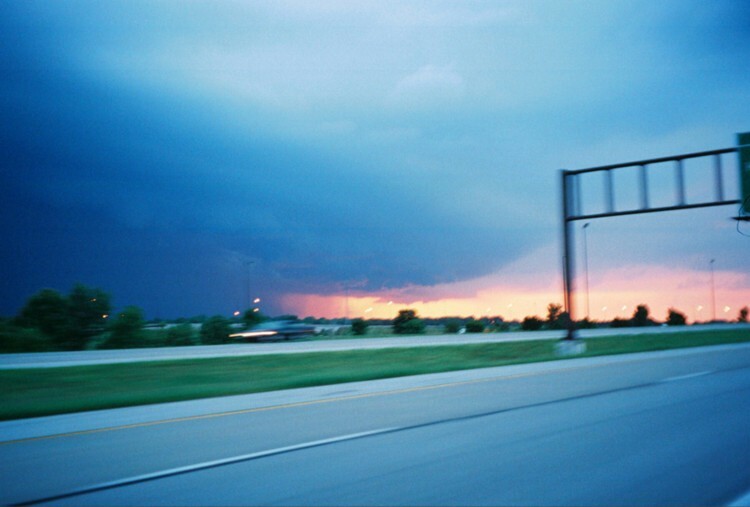 "Severe weather redeveloped Monday night in the eastern part of Madison County, where Illinois State Police said they had a confirmed report of a funnel cloud on the ground near Illinois Route 143, about 3 miles east of Interstate 55, shortly after 8:30 p.m. The storm was moving east toward Marine at about 30 mph, radar indicated, and was picking up debris, witnesses said." I drove out to that area the morning of July 6 to see if I could find any damage. There was no identifiable tornado track, and the only damage I saw was one tree down at the edge of a wooded area. Actually, there was more damage in the area around a half-mile south of my house, which would have been roughly the area the lowering passed over, but there, too, the damage was scattered and minor with no discernable track. Still, if there was indeed a debris cloud, it could have been a tornado. Since I was in town when I saw the lowerings, I could not see what was going on underneath. For the same reason, and also because I really thought they were scud fingers and was trying to beat the heavy precip area home, I got no pictures or video of these lowerings. It will be very interesting to see what Storm Data has to say about this event. It MAY be that I saw a tornado or developing tornado without fully realizing at the time - or it may be that it really was a scud finger and non-tornadic wind blew up the debris. Without being there, I can't say for sure, so I'll call it a "possible tornado" pending what the NWS concludes. FINAL UPDATE - December 12, 2004. The NWS has confirmed this as a tornado. The NCDC Storm Events database describes it in this link. A very brief tornado, but still a confirmed tornado, making this my first chase season with tornadoes seen on two different days. What a night - the west St. Louis County area had at least three severe storms move through the same general area. There were widespread wind damage and lots of hail reports from the first two storms. In the first one, Chesterfield had a 70 mph gust and nearby areas had hail to one inch (possibly from a trailing cell along the same line, just to the SW of the leading one). The second storm, which moved through between 9 and 10, produced 3/4 inch hail in Chesterfield and a 92 mph gust across the river at Scott AFB in Illinois. The third storm, moving into west St. Louis County around 11, produced 1.5 inch hail in Chesterfield, blew down large trees in Webster Groves, and resulted (combined with the earlier rain) in people being rescued from cars due to flooding near the Galleria in St. Louis County. Aside from the possible tornado just to the east, Edwardsville missed the worst of it, getting only scattered tree damage (mainly in and near the Willow Creek subdivision) in the first storm, pea-sized hail in the second storm, and nothing from the third one. 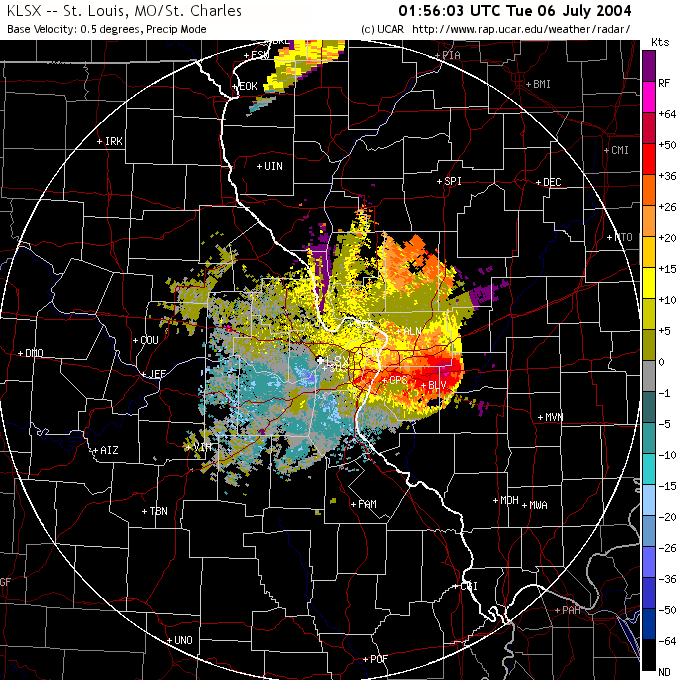 If all that isn't enough, there were also two severe storms early the morning of July 5, too, and both of them hit parts of St. Charles Co. and west St. Louis Co. So for some parts of west St. Louis Co, that was 5 severe storms in one day!). A total of 155,000 customers lost power on the Missouri side of the St. Louis area, and thousands more in Illinois. Many still did not have power 24 hours later. UPDATE: A total of about 225,000 customers lost power across the metropolitan area. Some did not get power back for nearly a week. This was described by power companies as one of the most widespread power outages ever caused by severe weather in the St. Louis area. 1. Reflectivity, 7:46 p.m. - The leading storm, about to enter St. Louis city from St. Louis County, is the one I was on - but by now, it is more like it was chasing me as I blasted east on highway 40. 2. Reflectivity image centered on Madison and St. Clair Counties, 8:35 p.m., from NWS Damage Survey Web page. 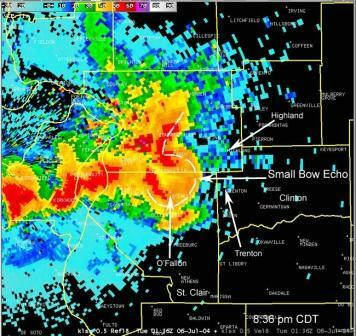 Note that the storm has now evolved into a small bow echo over southern Madison and northern St. Clair Counties, as noted on the image. The right angle in the dotted line drawn on the image highlights an inflow notch near the head of the bow echo, with a new area of heavy precipitation forming just northwest of the notch, just east or NE of Edardsville. 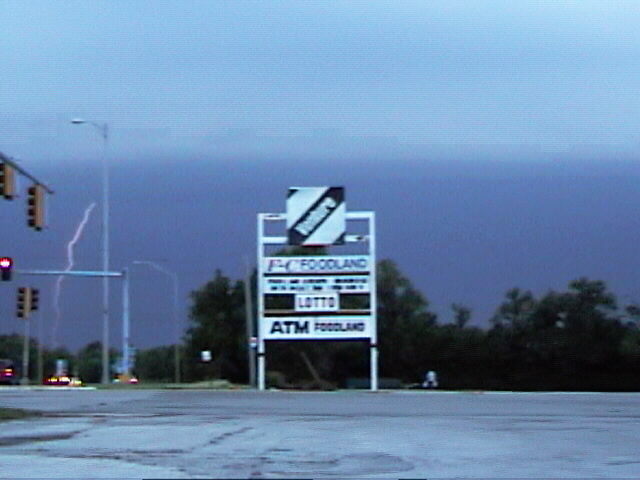 The tornado occurred in the inflow notch, where this air flowing into the storm was moving in the opposite direction from the strong outflow to the south. 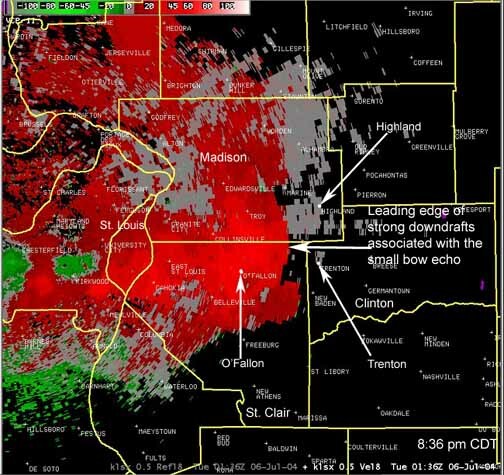 This radar image is supportive of the conclusion that a tornado did indeed occur, since the radar shows a storm environment conducive to the formation of a tornado. 3. Velocity image centered on Madison County, 8:36 p.m., from NWS Damage Survey Web page. The strong outflow winds associated with the bow echo can be seen in the bright red in south-central Madison and northern St. Clair Counties. But notice the small green spot between Edwardsville and Marine, indicating wind blowing toward the radar site, when everywhere else it was blowing away. This strongly suggests rotation, and is in the approximate location where the tornado was reported minutes later, and near where I saw the suspicious lowering. 4. Reflectivity, 8:56 p.m., about 15 minutes after the tornado report - Note that the storm still has a bow-echo structure, with outflow rushing southward ahead of the precip areas on the south flank of the storm, with the leading edge of the storm surging into Clinton County. Note also the slight notch just north of the apex of the bow, about on the line between Clintona and Bond Counties - this is the part of the storm associated with the tornado report, which has now moved a few miles to the ESE. 5. Base velocity, 8:56 p.m. - Right near where Bond, Clinton, and Madison Counties meet, there is still evidence of wind blowing in opposite directions. Although it would show up better on a storm-relative velocity image, if you zoom in on the image, you can see a little flow toward the radar site in that location. This suggests that there was at least some rotation in this part of the storm. Note also that, to the south of this feature, everywhere from northern Washington Co., IL all the way back to northern Jefferson Co., MO is experiencing wind motion of at least 36 knots away from the radar site. This produced a very sustained period of heavy winds across the metropolitan area, adding to the widespread damage. 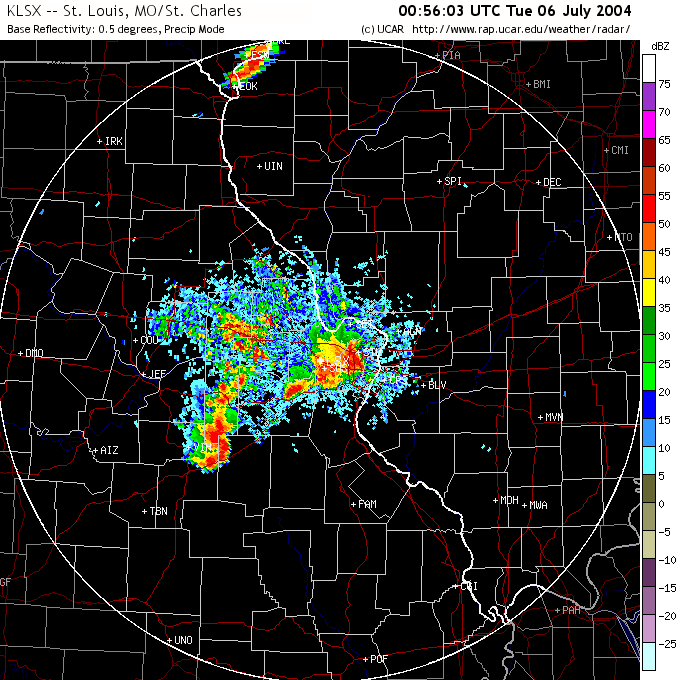 Finally, here are the local storm reports from the St. Louis NWS office. This page was last updated on December 12, 2004.